It all started in Atlanta, Georgia on January 28th, 2003, when millions of people were introduced to a skinny redhead who wore glasses and had a unique fashion style. The American Idol judges looked skeptical and no one knew what to expect. But like your mother used to say, don’t judge a book by its cover. 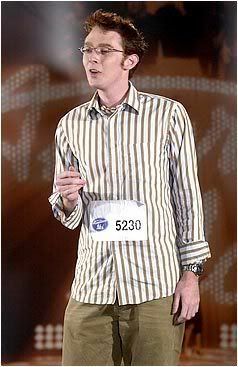 Clay Aiken opened his mouth to sing and the incredible voice that poured out amazed everyone. The skeptical judges watched and listened as Clay sang an excerpt from the 80’s song, Always and Forever and demonstrated his rich, clear voice. Randy Jackson wanted to know where the voice came from and Simon Cowell suggested that he didn’t look like a pop star. But, it’s all about the voice and so Clay, the unlikely pop star, made his first steps on an incredible journey. The voice continued to amaze through the following weeks. Clayton Aiken became Clay Aiken. He not only looked like a pop star, he became one. Please watch this incredible audition here. Error: Error validating access token: Session has expired on Tuesday, 21-Aug-18 16:13:01 PDT. The current time is Friday, 26-Apr-19 01:19:03 PDT.